Tom ‘Jabracada’ Hall began the final table of the 888Live London Main Event with a 2-1 chip lead over his nearest competitor and 31.5% of the total chips in play. It took him a little over eight hours, but Hall eventually ended up with all of the chips and a £78,888 ($117,805 US) payday after beating Ning Lu heads up. It took over two hours before the final table saw an elimination. Hall opened to 80,000 from the hijack before Pascal Pflock bet his last 535,000 from the cutoff. Action folded back around to Hall who thought for 30 seconds before calling. Pflock was ahead with against Hall’s but after the board ran out , Pflock was eliminated in ninth place and Hall added to his lead. Just 20 minutes later, Hall went back to work in thinning the field. Daniel Stanway raised to 110,000 from middle position, Shao Zhen moved all in for 665,000 from the button and Hall called from the small blind. Stanway folded and Zhen revealed but found bad news when Hall flipped over . The flop kept Hall in front and neither the turn or river offered Zhen any salvation and he was out in eighth place. The next elimination didn’t include Hall.Paul Nugent moved all in for 720,000 from UTG+1 and Pol Canals Hernandez moved all in over the top from the cutoff forcing the rest of the table to fold. Nugent showed while Hernandez was ahead with . The flop gave Hernandez top set and as the turn and river were dealt, Nugent was eliminated in seventh place. Three hands later Charles Akadiri moved all in for 965,000 from the hijack. Action folded to Hernandez on the button and he called and tabled . Akadiri was behind with and got no help through the runout and was eliminated in sixth place. Lu picked up his first elimination just ten minutes later. Action folded to Lu in the small blind and he moved all in and a short-stacked Stanway called all in from the big blind. Lu found out he was well ahead after showing to Stanway’s . There was no help for Stanway on the board and he was sent home in fifth place. The first five eliminations went relatively quickly, but getting from four players down to a champion took much longer. Some 2.5 hours after Stanway’s elimination in fifth, Paul Scipioni became Lu’s next victim. Scipioni moved all in from the small blind for 1,100,000 and Lu called from the big blind. Scipioni showed while Lu was quite happy to turn over . The flop changed nothing and Scipioni was only to watch in despair as the hit the turn and the hit the river. There was another 2.5-hour gap between eliminations as the final three players battled it out. From the button, Hernandez moved all in for 1,900,000 and Lu, sitting in the small blind, asked for a count before calling the all in. Hall folded, Hernandez turned over and Lu showed . The flop kept Lu ahead and the turn sealed the hand for Lu. The meaningless river was the and Hernandez was out with a third place finish. When heads-up play began, Hall was facing a 2-1 chip deficit, but , Hall reversed that over the course of the next two hours. Before that however the final two players agreed to a deal that saw Lu guarantee himself £72,142 while Hall got £72,000. That left £8,888 to play for. The final hand saw Lu move all in with and Hall called with . 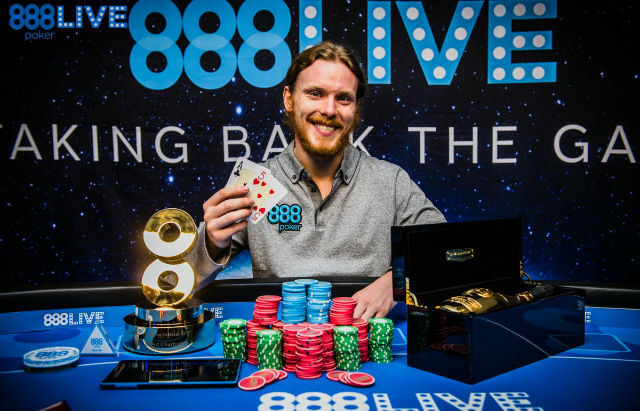 The flop gave both players a piece but neither the turn or river were any help to Lu, giving Hall the 888Live London Main Event title and £78,888. The 888Live London Main Event had a buy-in of £1,100 ($1,450 US) and drew 427 players for a total prize pool of £427,730 – beating the £400,000 guarantee.